Nothing says fun-filled family vacation quite like The Communist Manifesto, eh? I admit that I have no background in political or economical theory. My decision to read this book was purely out of literary interests. Like Darwin's Origin of Species, it's one of those 19th century books that have had an undeniable impact on our modern world. Disappointingly, I don't think I gained a whole lot of new insight or altered my views much after reading it. Surprisingly, the book was easy to understand. I had thought it would be dated, complicated, or both. Marx's style (Engels, despite being credited, apparently had little to do with the writing) was simple and direct. The problem I had came from the introduction. My version (not the one shown above), written in the 60s, had an introduction by A.J.P. Taylor which despite trying to provide balance, just clouded matters for me. Wading through his thinly disguised cheap shots of Marx and his theories, there were some good illustrations of how Marx's theories were not perfect, and how many of his "predictions" did not come true (though I found the Free Trade piece interesting- A.J.P. Taylor said Marx was off base in saying that Capitalism would lead to Free Trade and a global economy- flash forward to NAFTA and the EU). Of course balance is usually a good thing. The problem with me was having it provided in the same text. In the end, I felt that both sides had tried to pull a number on me. When it comes to politics, everyone has an agenda and facts are as malleable as fiction. But perhaps due to a naive mind, I still think there are merits with Socialism and problems with Capitalism. I just can't see why Democracy usually gets paralleled with Capitalism, Socialism with Communism. I blame Marx. I read this book last year, but believe it came with a different introduction then the one you mention. As far as cloudy intros go, I had a similar experience recently, reading Lament for a Nation, which came with a 100 page introduction, and the book itself was only 200 pages. It was as though it was trying to justify itself, and even though the book itself is dated I found the longer intro just made things worse. Like the one in Lament, the intro to my copy of Manifesto was as long as the Manifesto itself. It felt as if Penguin (the publishers) were only comfortable publishing it as long as they could prove that they did not support Marx's views. Oh and in case anyone's interested Pi has been found! Your blog has been disappearing all day, John! Glad it's back now. Do tell about Pi! Where was it found? Who found it? How very saucy of you to read the Communist Manifesto whilst crossing the border into the US! Did you call the border guard a douche hat as well? 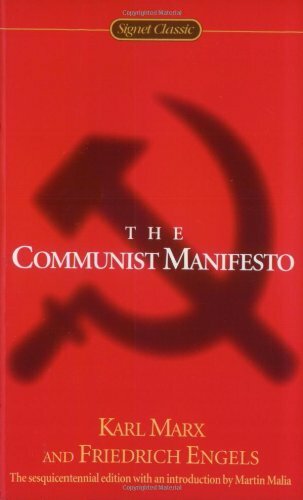 I have been meaning to read the Communist Manifesto for years, but I believe I will forego the introduction, at least until after I read the manifesto itself. Long intros annoy me, anyway. Oh yes, must share of where Pi was found! I could have been saucier I guess. Could have been reading the Qu'ran. A trip to Guatanamo might be nice actually. As for where Pi was found, just click on the link in the sidebar.